This publication opens series of "IMESClub Interviews". Discussion took place on the 28th of August in Moscow. 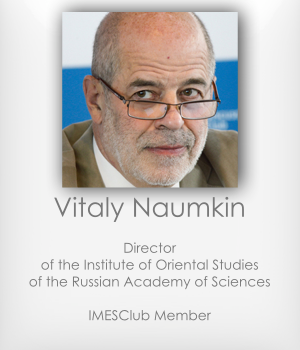 Professor Vitaliy Naumkin answered several thorny questions posed by IMESClub Pesident Maria Dubovikova . Maria Dubovikova: I would like to start this conversation with a question that sums up the whole decade. How would you characterize this decade for the Middle East? Which mistakes were made by the intra- and outer-regional players, by the international community? Vitaly Naumkin: Well, I would prefer not to talk in terms of “mistakes”, it’s much better to talk about the positive and negative trends. Speaking about the positive trends that took place in these last ten years, a good economic growth in most countries of the Middle East could be mentioned in particular. After all, we're not just talking about the Arab world, but about the whole Middle East, right? V.N. : For example a considerable economic success of Turkey can be specially noted. Moreover many Arab countries have experienced economic growth, modernization, and development of modern financial and economic institutions. Somewhere this process was fast, even including some countries that have experienced the "Arab Spring," somewhere rather slow. Good results of economic development were shown, for example, by Egypt. Therefore, we can talk about different trends and shifts that were positive, not negative. Among them there are the process of shaping of the civil society which is however rather limited; spreading, not everywhere of course, of high technologies, especially information technologies. A number of countries are establishing cell-phone networks. The growth of the Internet use. Increasing number of educated youth who are getting education not only in their native countries but also abroad. There are many other trends that can be characterized as concrete steps towards a modernization, modern development and general integration into the basic matrix of global development. Among the negative trends it is possible to mention stagnation, mainly in the political life, and a number of other processes that especially led to the “Arab Spring”. It is an absence of means of vertical social mobility for people, monopolization of all the levers of state control including financial and governmental resources by the bureaucratic elites. And, of course, high level of unemployment in some countries, poverty, etc. The Middle East is corroded by the inner conflicts. It is the growth of interconfessional, ethnic, interstate and intraconfessional contradictions, which are often very severe. Also there are many unregulated old conflicts, primarily the Arab-Israeli. Back to the question about the mistakes, it is possible to name the growth of religious fundamentalism, extremism, inability of the regimes to deal with the terrorism among them. All that leads to the serious deterioration of the image of people living in the region beyond its borders: in Europe, in the West in general. The intrusion of the Allied Forces to Iraq in 2003 can be undoubtedly considered as a mistake. As a result the interventionists failed to provide security, first of all – for the country’s people. In a decade more than 200 thousand people died, several millions became refugees or were displaced within the country, only 400 thousand of 1400 thousand Christians left. There was a mass exodus of Christians from Iraq. The minorities, mainly Christians are discriminated, there are non-stop terrorist acts and the hostility between the Sunni and the Shiah is periodically getting worse. Of course, the situation has partially stabilized – it has ameliorated. But generally it is possible to say that the plans of our US partners to quickly establish a modern democratic state, eliminate the internal conflicts and unite the nation have failed. I believe that Bush's interventionalism was the main mistake and it was replaced by Obama's administration milder attitude to the region and to the interventions. However, Bush's heritage still lives and it will take very long to remove its traces. That is why the interventionalism and the attempts to project their own model of liberal democracy face a severe resistance of the elites and the people. This continues to deteriorate the security in the region and to impede the mutual understanding between the Middle Eastern countries and external players. M.D. : Speaking about the Gulf countries having the particular influence on the development of the Middle East, how would you estimate their influence? Which effect would the current policy of the two power centers – Saudi Arabia and Qatar, have on the development of Middle East, positive or negative? V.N. : Regarding the Gulf countries, they largely represent a successful model of development, primarily because they poses huge financial resources. They can easily switch between these resources from one field to another and easily manipulate them in order to neutralize grievances and solve social problems if necessary. But at the same time, these countries do not have any immunity to the existing protest sentiments - while other countries deal with the more severe forms of such sentiments. Take the issue of Bahrain, where there was a very powerful protest movement. Although it was neutralized, the discontent of the two thirds of the population belonging to the Shia and consider themselves disadvantaged remains. There is a difficult internal situation in Saudi Arabia, which also has a grain of conflict. It is impossible to ignore the intense rivalry between the different states of the Persian Gulf, including one in the religious and ideological sphere. Take a rather intense rivalry between Qatar and Saudi Arabia. Qatar relied on the support of the "Muslim Brotherhood" and the Saudis - on the Salafis, and as we can see by the recent Egyptian events, they supported the military coup in Egypt. While previously these countries acted together as supporters of the Islamic protest movement, and was considered that they are leading all new Islamic forces to the power, today their views diverged. Saudi Arabia, before oriented on supporting the Salafist parties, plays well with the new secular forces today, including those representing the old regimes, such as the Egyptian military. Qatar also remains committed to the "Muslim Brotherhood" which has lost ground in Egypt, and together with Turkey acts in their support. So I am not inclined to consider all the countries of the Gulf as a single entity. For example, the United Arab Emirates sharply opposed the "Muslim Brotherhood" from the outset, limited their activities in the country and subjected their representatives to repression. The Gulf States are playing a double role in the region. They contribute to the financing of a number of projects in the Arab countries, assist in resolving their economic problems at no charge. But at the same time, impudent aggressiveness with which these countries are trying by force to resolve the internal conflict in Syria, only exacerbates the situation in the region and does not lead the Middle East to peace and stability. M.D. : In a way, my next question concerns the Syrian problem. As the latest trend shows, Russia has began to play a more significant role in the Middle East and in many respects its interests are in conflict with the US policy. Do you think that the Middle East is able once again to become a field of confrontation of two powers as it was during the Cold War? V.N. : I do not think it can. Firstly, because Russia does not enter an intense rivalry with the Americans for the area of influence. And the Russian influence in the region, to be honest, is very limited. Russia's main partners are still not the Arab states. This is, for example, Turkey. Although Turkey is a NATO member and wants to be admitted to the European Union, relations with Russia are very active, and developed very well in recent years. Turkey - one of the most important economic partners of our country, and Russia does not also have any sufficient political disagreements with it. The main stumbling stone in Russian - Turkish relations is the divergence of positions on the Syrian conflict. But this difference does not prevent the two countries from moving forward in increasing the volume of trade and economic cooperation, in the implementation of new projects, etc. I'm not talking about humanitarian relationships, the number of Russian tourists in Turkey, a flurry of activity on the business, etc. During the zero-sum game Turkey would be seen as a rival, as it is an ally of the potential enemy - the United States. Today is it impossible to pose a question this way. Moreover, today Russia has sufficient understanding with the Americans in the region. Russia and the U.S. are working together within the framework of the Quartet of international mediators in the settlement of the Arab- Israeli conflict. Our positions on the settlement differ only slightly. Russia, for example, does not consider Hamas a terrorist organization and works with this movement. Russia is more critical than the United States towards the Israel's plans for the development of territories, build settlements, but, nevertheless, the overall positions of Russia and the U.S. to the resolution are very similar, there is a close cooperation. Even on the issue of Iran, where there are serious differences, Russia and the United States will still cooperate acting in the format of the dialogue between Iran and the 5+1. Our country has repeatedly voted for the resolutions related to the response to the opacity of the Iranian nuclear program in UN Security Council. Iranian node in the context of non-proliferation is one of the main areas of cooperation with the United States. The same can be said about Afghanistan, even though it probably refers to Central Asia, but the Afghan issue is impossible to ignore because it is important for the entire Islamic world. As you know, Russia is also actively cooperating with America, without getting into the conflict and the American actions in Afghanistan, it is helping to build the Afghan state, helping the Americans to resolve supply issues of their contingent and ensure its safe withdrawal, acting fairly consistent, regardless of those difficulties that arise in Russian- American relations. Therefore, I see no reason for the rivalry between Russia and the U.S. in the region. Differences will persist. But even in the most tense case - with the Syrian conflict, where Russian and the United States assessments, policy plans and mode of conduct differ radically, there are still common interests. They consist in that firstly neither party wants to allow chaos in this country. At least, I see the interests of the United that way. Another thing is that some Russian politicians today have reason to blame Washington that it wants to create a controlled chaos out there. But still, it is in the American interest, in my opinion, to establish order and stability in the country. Secondly, talking about the coincidence of interests - we do not want to have a state of the Islamic radicals who would cut his throat to everyone who does not think like them there. There are also a common interest is to halt the bloodshed, civil war, to prevent the spread of weapons of mass destruction. But their views significantly diverge on how to do it and how to respond to what is going on. But look, despite the radical opposition between Russia and the U.S., they still have managed to agree on joint steps for the Geneva-2, the second international conference on Syria. And the chances are not completely lost yet. M.D. : Let's go back a little bit back, to the Arab-Israeli conflict, you mentioned, and to the role of Russia and the United States, and then return to Syria. Under present conditions, when the region is absolutely losing its stability, what are the real prospects of efficient and effective conflict resolution? Do they disappear or are they still real enough? V.N. : It is hard to be optimistic about the Arab-Israeli peace process, although there was a shift. The peace process has been resumed a term of nine months has been set to reach a final status agreement. I honestly do not think that it is possible to do it in nine months. There are several problems, among which it is possible to mention two most painful ones - the issue of Jerusalem and the refugee problem. If it is still possible to anticipate some possibility of compromise on Jerusalem, the problem of refugees today has very aggravated, as the Palestinian self-awareness has strongly increased and it is impossible to deny the right of refugees to return. But for Israel accepting this demand means causing the condemnation by the majority of population, for which such a decision would be a tragedy. For them, the return of Palestinians, let's say, in Haifa, located in what is now Israel, which Palestinians left in 1948, is unacceptable. How can this issue be resolved? In general, it can be solved, but it requires negotiation. Some reasonable Israeli politics offer the Palestinians the option of returning the refugees only to the territory of a future Palestinian state. In this case, the Palestinians will have the right either to return to their lost homes, or the right to compensation. However, these solutions do not suit all the Palestinians. And it is very difficult to suppose that it will be possible to overcome these grave differences in nine months. Some Israeli partners have an idea to still return to the issue of an interim solution of the problem. To sign an agreement, say, with the exception of these two items, which will be deferred to a later period. Palestinians were always against the interim agreement before. In my opinion, in order to make them do it, they should get some serious concessions from the Israeli side, say, on the territorial issue. Would it be possible to implement it? The border issue is also not easy, but there can still be an agreement because there is already a preliminary agreement, which can be taken. The idea of swaps, the territorial exchange, is acceptable for the moderate Palestinian elite, and, I believe, it has a potential to be realized. The question arises whether it is possible to extend the deadline for reaching a final status from a nine-month to something else. Postpone it for a year, say. But in this case, there are legitimate concerns that the period may be extended to infinity, which will bury any hopes of a full settlement. Today, Obama needs a success. He even wants to achieve something in the Middle East. At the moment, America loses a lot. There is a growing discontent in almost all corners of the Arab world against it. Look at what happened in Egypt! The Americans committed the same mistake twice, first they supported Mubarak, and they still reproached for betting on dictators. Then they quickly passed him and displeased those who hoped that they would support him. The U.S. has long worked with the "Muslim Brotherhood", enthusiastically talked about their democratic aspirations, their moderation, then the same Egyptian masses have allowed the military to remove the «Brothers» from power – now both "Brothers" and the new authorities are dissatisfied with the Americans. Yes, they were, in fact, always dissatisfied, because the United States, in their view, are entirely on the side of Israel in the conflict with the Palestinians. Now the new government of Egypt, the military and the civilian, including even liberal organizations, accuse the Americans of their support for the "Muslim Brotherhood". As a result the image of the United States has suffered greatly, their influence waned, their ability to manage processes occurring in the region declined. In Iraq, too, not everything is going well. In Afghanistan - the same thing. Libya is in a complete breakdown, chaos. Therefore, Obama must achieve at least something. We are not gloating about it, saying that America has lost two wars, that its policy towards the "Arab Spring" has failed. Who knows what will be the outcome of the US threats to launch an air-missile attack on Syria. If they choose a military intervention, it will not lead to the implementation of their goals and will cause huge damage to the region. We are totally against it. And, I think, Russia will support Obama's desire to resolve the Middle East conflict in all circumstances. M.D. : Returning to the question of Syria. The other day, the Arab League after its meeting has condemned the chemical attack near Damascus, but refused to take part in any operation of the West, which was the completely different reaction compared to the case of Libya. What is the reason of such a sharp turn? Failure in Libya? Or this is some different understanding of the conflict? V.N. : I believe this is both another understanding of the conflict and the "Libyan syndrome". There is no unity among the Arab countries. But if the Arab sponsors of intervention could push through the support of U.S. intervention, it still would (and it will if they manage) lead only to more bloodshed and to the hatred of more Muslims against the United States, and the people who will do it, will be responsible for it. They will look like American's puppets willing to dump stable regimes for their own selfish purposes. Will have to answer for it. The other day, an American colonel, who participated in the operation in Kosovo, McGregor, very well mentioned for this occasion that there are no bad guys and good guys in civil wars, there are only winners and losers, and one does not need to intervene. Civil wars were everywhere. During the American Civil War more people were killed than today in Syria. We shall not speak about the casualties during the civil war in Russia. And we still do not know who were the bad guys and the good guys. Kappel and Kolchak forces were the most brutal punishers. Today, many consider Kolchak a hero. In the civil war there is no right or wrong. So today, if the West wants to intervene in the war and make others win with their help - it will be a disaster. It is not for the West with his limited understanding of Middle Eastern societies to judge who is right and wrong. Not to mention the fact that the Americans will actually be standing shoulder to shoulder with those who hate Americans and their main ally - Israel, with those, who tomorrow, as it has happened in history, will turn their weapons against them, I think it would be a tragic error. I'm sure Obama understands this. M.D. : To conclude our discussion, I suggest drawing interim results of the "Arab spring": who at the moment is among the losers, and who - among the winners? V.N. : I do not know, who is who now. M.D. : Even in case of Tunisia, Libya, Egypt? V.N. : Well, we see very contradictory results. On the one hand, the Arab peoples have won, because they have shown that they are legitimate citizens of their countries, they can decide their own fate. On the other hand, it turned out that they are losers the same time. Because interest groups, various elites who mainly do not express the interests of the majority of the population, pursuing their own selfish goals, took advantage of the fruits of the mass protest movements. What did, for example, "Muslim Brotherhood" do in Egypt? Taking suddenly unexpected steps towards Islamization and the monopolization of power, they repeated the mistakes of Mubarak and caused resentment among those who voted for them.